Irish Record 365lb taken in 1932 by Dr O’Donel Brown at Keem Bay, Achill. The Porbeagle is a powerfully built shark, shorter and deeper than the standard streamlined fish. The pectorals and dorsal are large and there is a caudal keel on the wrist of the tail. The lower trailing edge of the dorsal is usually white. The under-belly is white, and there is darker shadowing along the edges of the under-side of the pectorals. The flanks are light grey leading on to grey and dark-grey back. The mouth is well-equipped with several rows of small but extremely sharp teeth. This is a wide-ranging member of the shark family, and quite at home in the colder waters of the north. They regularly show along the north and east of the Donegal coast, sometimes quite close in-shore. They are wide-spread in this area, venturing as far south as Ballycastle, where I have witnessed Porbeagle on several occasions, but at that time, was never equipped to target them. 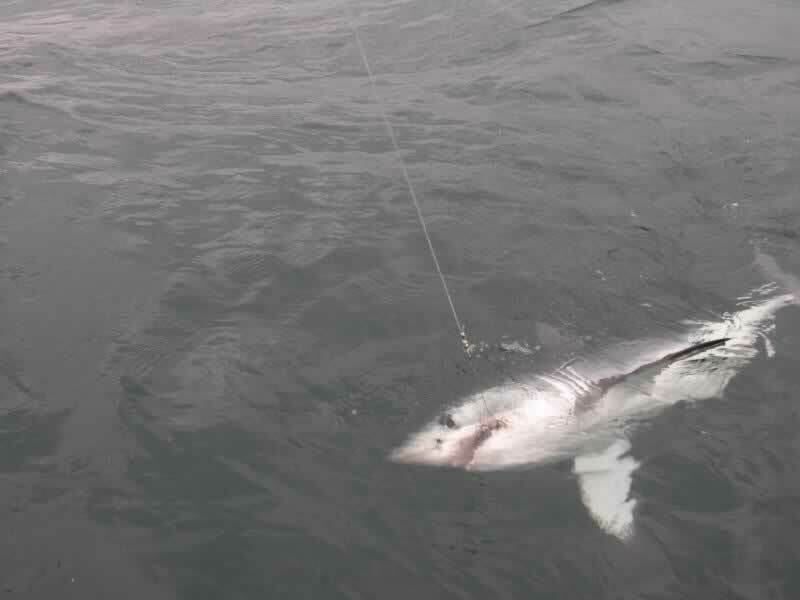 I strongly believe I hooked a Porbeagle whilst fishing between the Maiden Islands out of Larne Lough, but lost it on light tackle after twenty minutes or so. They are also famously targeted from ports out of Galway on the south-western shores. Through most of the Irish season from late spring to autumn and into winter at some areas. Many are taken on whole Mackerel, sometimes by accident whilst targeting Blue Shark. However, Coalfish and Pollack make excellent large baits when you feel that a Mackerel just isn’t enough! Fish from 2-4 lbs are no problem for a large “Porgy”! When specifically targeting Porbeagle, it is a good idea to “step-up” the tackle slightly from that used when targeting “Blues”. A 50lb class outfit is considered more suitable with size 10/0-12/0 hooks, depending on bait size. It is important not to mask the hook. Heavy wire biting trace of 300lbs + and heavy duty swivels are recommended. Use a “rubbing” trace of 250-300lb nylon as protection against the shark’s rough skin. With this equipment, you will stand a great chance of landing any larger Porbeagle that may be encountered. Either drifting with a scent trail of mashed fish, or trolling can be carried out, both methods are equally successful. 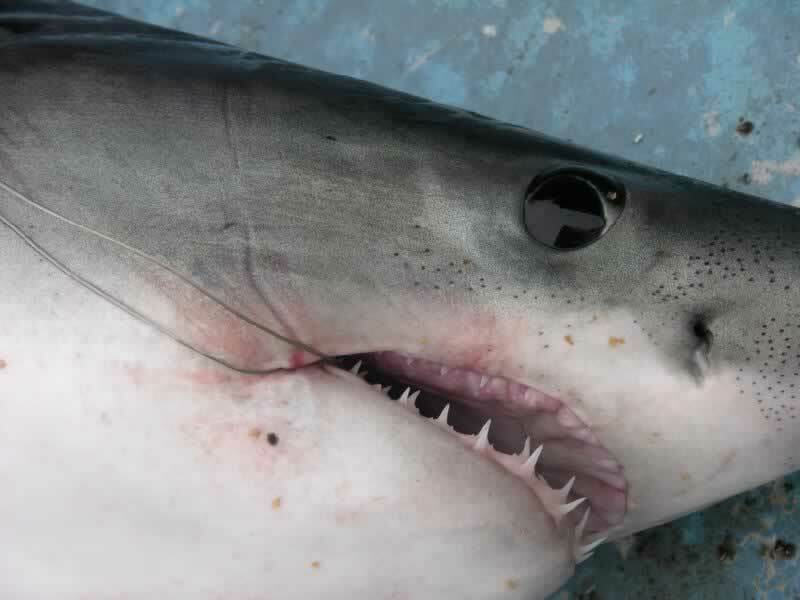 Porbeagle are powerful sharks and quite awkward to deal with, especially on a small boat. It is usually safer for shark and angler, and certainly a lot easier, to un-hook the fish on the sea-ward side of the gunwales, unless measuring and tagging is required, although with experience, this can also be performed while the shark is in the water.